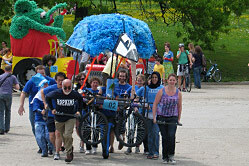 The Johns Hopkins University submitted its first kinetic entry, Twitter Jay and the Recyclists to commemorate their blue jay mascot. 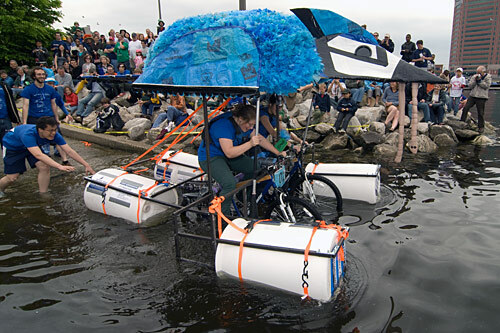 The blue shell was created out of a vast quantity of recycled plastic grocery bags. 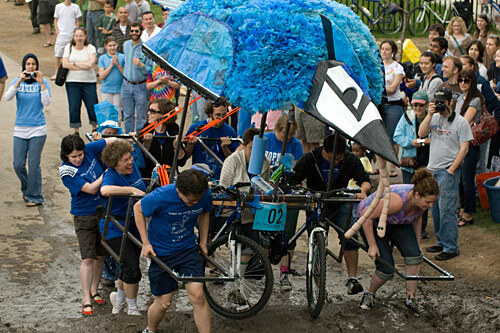 However, the sculpture’s engineering had major problems; near the National Aquarium they had a catastrophic taco-wheel failure and the crew had to resort to carrying it the rest of the race. It had been intended that spectators send text messages for the sculpture’s LED display, but once the carrying began, the electronics and other weighty elements were jettisoned. Twitter Jay’s team was awarded the Golden Dinosaur award for their breakdowns and dealing with them in style. See their video on Youtube!